Set up in 2010, Canyon went out to make a premium ice chest that delivers premium features under the non-premium price tag. The canyon is relatively a newcomer in the Cooler sector. With their not so huge product line up, you can find different coolers having different storage series. Canyon deals in two different series of Coolers called “Adventure Series and Outfitter Series.” Along with the coolers, Canyon manufactures Drinkware and Accessories. Where can you buy Canyon Coolers? Talking about the product line up of Canyon cooler, Canyon has a diverse and impressive array of products line up. Canyon deals in Hard-Sided Coolers. Currently, Canyon has launched two series which they call as “Adventure Series” and “Outfitter Series”. Let’s be familiar with both the series. Talking about the Adventure Series, Canyon deals in four different cooler that are named as prospector 103, Canyon Cooler Scout 22, Canyon Cooler Scout 30 and the Canyon Cooler quest Back Pack Soft Cooler. These coolers come with the different storage capacity and in vibrant colors. These coolers brag about their superior build quality. For more Adventure Hard-sided series And soft-sided series visit here. Coming to the Outfitter Series, one can find outfitter 35, outfitter 55, outfitter 22, outfitter 75, outfitter 125. These are the most premium coolers as claimed by the Canyon under non-premium price tags. Availability in different storage capacity has hit potential customers. Like Adventure Series, these coolers come with great strength and durability. For more Outfitter Series or information click here. Now that we are well versed with the Canyon Cooler, its history, its product line up and much more. It’s time to proceed and check what Canyon offers to its customers that make it unbeatable. Let’s break down the specifications of Adventure Series and Outfitter Series. Under the Adventure Series launched by the Canyon, one can find different sizes of coolers. Moreover, they come in beautiful colors so you do not have to compromise with the colors. 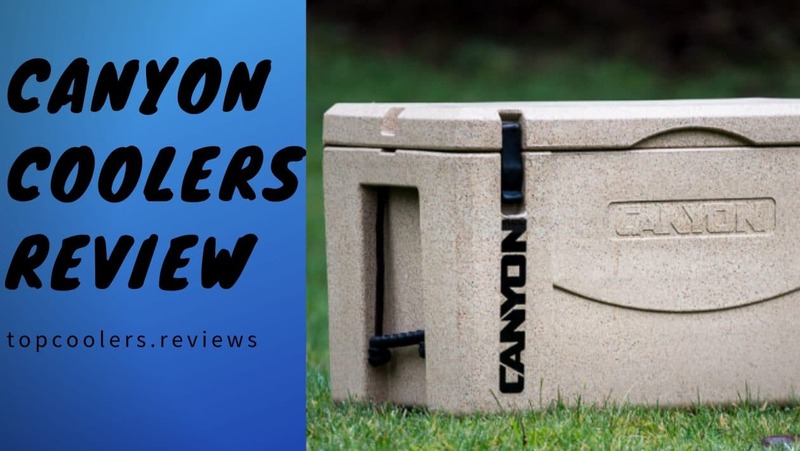 What Canyon brags about its coolers is the fact that they are rock-solid and they have a bombproof construction. Rotomolded Constructions – The rotomolded technology ensures that the coolers are tough, strong and durable. That’s another standard if the coolers want to compete in the industry. Besides this, they have HUNTX foam installed inside the coolers that keep your beverage cold and safe. Drain Plug – You don’t have to worry about the leakage thing since these coolers come with the redesigned drain plugs. The redesigned drain plugs ensure that there are no leakage problems and you don’t run out of your ice. Built-in Opener – What’s more interesting to know that these coolers come with the built-in opener. So, carrying additional opener while camping out is not mandatory. Canyon Adventure Series come in Hard Sided Coolers and Soft Sided Coolers. The ice chests in these series considerably differ a lot when it comes to specifications and performance. Large models dominate when it comes to ice retaining performance. Moreover, the smaller models won’t disappoint you in terms of performance. You can choose from personalized coolers to larger coolers depending upon your budget and specifications. Mobility – Canyon Adventure Coolers are quite easy to move. With the wheels attached, the canyon makes sure that your back doesn’t hurt while carrying the cooler. The Canyon Adventure coolers also come with the multiple tie-down points to easily attach your cooler with the boats. For the purpose of handling, you can kind the nylon strap that comes with the cooler. Appearance – As far as appearance is concerned, the Canyon was much focussed on the features than the appearance. There are just limited colors to choose from. You can find sandstone and white marble color under the Adventure series. Moreover, the customization features are not being offered by the Canyon. You can’t get your own personal design, pattern, color that might drive you super crazy. Cost – Is the price justified? We are completely satisfied with the price they are charging. There are many other brands who charge much higher unreasonably. The canyon is offering plenty of features that are too hard to resist and at the same time, prices are under the non-premium category. Moreover, they are providing the lifetime warranty to have you covered and that gives one more reason to justify the price. Insulation Ability – Until a cooler does not give a great insulation ability, the purpose to buy the cooler remains unfulfilled. We have already talked about the ice retaining capacity of all the models under the Adventure series and we are really impressed by the results we got. With the unique blend of rotomolded technology, AirTight seal and HUNTX Foam give a great ice life to these coolers. Whatever model you choose to go for, we assure you won’t get disappointed with the performance. Even the smaller model has the capacity to retain the ice for a day and in case of the larger model, it may go up to the week. Durability – After the ice retention ice, one thing that can’t be overlooked is the build quality. Is the cooler strong enough to handle wear or tear? How superior is its build quality? Until you don’t find the answer to these questions, don’t proceed to buy. Talking about the durability of Canyon adventure coolers, these coolers are designed with the rotomolded technology. Moreover, the wheels provided in the coolers will stick by your side whether you camp on mountains, terrain, hills. Along with the Canyon Cooler Adventure Series, the Canyon deals in Outfitter Series as well. One can find a limited number of coolers. For the time being, the Canyon has to offer only 5 coolers in this series. This include outfitter 22, outfitter 35, outfitter 55, outfitter 75, outfitter 125. Talking about the quality and build, they are designed with the rotomolded technology that ensures it can suffer your normal abuse whether you kick or sit on it. HUNTX Foam– Coming to the lid, the Outfitter series comes with the recessed solid material hinge. This system does not let your lid fall again and again when you open the ice chest. You can also enjoy the feature of HUNTX foam that resists the heat and keeps your beer and sandwich cold. Airtight Seal- Moving on, for the ice retention or ice life, the Canyon Cooler Outfitter series comes with the airtight seal. Rubber Gasket– The gasket inside the cooler creates an airtight junction that ensures the delivery of high insulation period. Drain Plug– The drain plug technology built in the coolers prevents the leakage and you can travel without being worried. Canyon Coolers outfitter series come in different sizes. From personalized coolers to Large coolers with more than 100 quarts, Canyon has got you covered. Moreover, their ice retention period considerably differs from each other. Below, we have provided you comparison among these coolers that will give you brief about the specifications and performance of Canyon Outfitter coolers. Durability – You can expect the similar durability like that in Adventure series. Made with the rotomolded technology, the Outfitter cooler series is quite strong and durable. Like there will arise no problem of leakage as the coolers come with the drain plugs that prevent any sort of leakage inside the cooler. So, both the Outfitter series and the adventure series coolers are almost similar when talking about the durability. Mobility – Talking about the mobility, unlike the adventure series, the coolers do not come with the hard wheels so carrying or moving the cooler back and forth feels a tad terrible. Other than that, there is a nylon tie-down strap that makes it easier to carry the coolers. The lack of hard wheels remains a disappointment. Appearance – Like we all know there are a limited number of options to choose from, the colors are also limited. You can have access to only two colors i.e Sandstone and white marble. Moreover, the customization is not offered by the Canyon on any of its series. So, this factor remains a minor disappointment but still, it can be overlooked. Cost – Canyon Outfitter Cooler series fall in the category of a premium brand. Prices charged by the canyon are much more affordable than the rest of brands. Besides this, by providing the lifetime warranty, there are backing up their product. Thus, buying the cooler ultimately feels worthy. Ice Life – We are pretty much amazed by the ice retaining ability of Canyon outfitter cooler. They have the ice retaining capacity that goes for days. We have already talked about the Ice retaining capacity of Canyon Cooler. Designed with the rotomolded technology, the thick walls allows great ice retention and never let you run out of your ice. Like the Adventure series coolers, these coolers come with the HUNTX foam that enhances the insulation ability. Ice life is something we don’t want to take for granted. The basic purpose a cooler is to retain the ice life for the longer period. If the cooler fails to serve the basic purpose, what’s the use of having that cooler? So, For a smarter decision, always ensure that the cooler has high ice life. Here’s the test that we conducted on Canyon Adventure Series and Canyon Outfitter Series Coolers. These tests reveal if these coolers will live up to your expectations or not. Like we have already talked that the smaller model has the less ice retaining capacity. While the larger model holds a great capacity to retain the ice. We are really impressed by the 222 Long model Variations in different climatic conditions may bring variations in the ice retaining capacity. If a brand wants to stand out from the crowd, the brand needs to provide the high ice retention. If a brand fails to serve its customer, the rest of the features and specification becomes worthless. Now, we know the features and specifications of both the categories, let’s check out how these coolers perform in terms of Ice Retention. Buying the canyon coolers are much easy. So, if you are looking to buy coolers from any series i.e Adventure Series or Outfitter Series, you can visit the Canyon’s Store. But we advise you to buy from the Amazon’s website. You will get the coolers at the best possible price and you can save some bucks. Moreover, you can expect free shipping and delivery from the Amazon. So, visit the official website of Amazon since they have plenty of Canyon coolers. Choose your desired model and grab them fast. We are much impressed by the Canyon Coolers. Both of their series i.e Adventure Series and Outfitter series offers many unique features under the non-premium price tag. The thing is that they have just a limited number of options and colors. So, if you are the planning to buy a cooler that is durable and has a great ice retention life, this factor can be overlooked. Moreover, they will save some bucks for a rainy day.